I could call this segment “want but can not have.” We knew going into this show that the pricing would be “look, don’t buy”. Though, I did give myself permission to buy a sewing case or needle-book. There were none. I did not expect to see three pieces I really, really wanted to bring home. 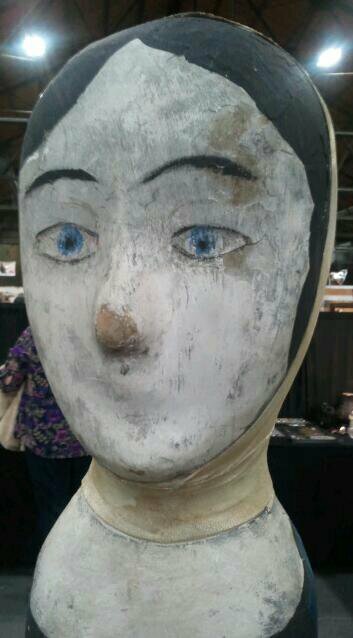 First is this milliner’s display head. She was lovely. She was in beautiful shape. I was able to get a good look at her painting and the way her head was wrapped under where the bonnet would sit in what looked like thing strips of leather. She also lacked a price tag. 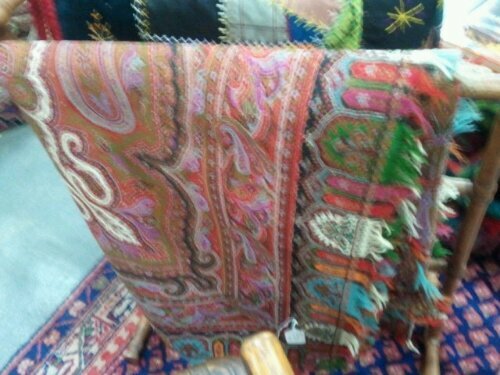 Then came two Paisley shawls. The first was a beautiful, near perfect condition 1840s square. The whole thing was comprised of compartmented medallions. The reverse showed so very well the transition from not trimming the back threads to beginning to. While the vast majority of the shawl was not trimmed, the smallish areas so solid color were neatly hand trimmed. The seller was the sweetest lady. She bought the shawl in Vermont along with a beautiful quilt. While she was whiling to negotiate the price, I still couldn’t because it would have meant not getting my much needed shelves. Then came this shawl. The purples are what caught my eye. Wow! What color. I’m accustom to seeing greens and blues pop like that, but the purple was unique. 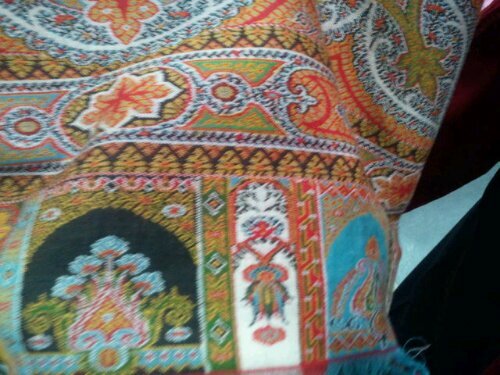 As soon as I went to touch this shawl, the vendor jumped right in to show it to me. She was much more of a hard seller. The first thing I noticed when I picked it up was the coarse, thick texture. Someone washed this with a lot of agitation. Not good. The center field was very small (a seemed selling point to the vendor) with a signature worked in. Usually, I see a signature with tapestry twill weave shawls (this was not) or embroidered shawls (this was not) or pieced shawls (this was not). Then I noticed this seam…… The border is an added on each side. Oh, how I wanted to measure the inside panel to see which size bracket if fell into. 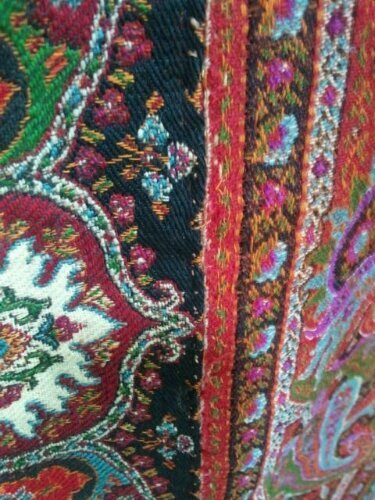 In general, I would have liked to spend more time with this shawl to work out some curious oddities in it. As purchasing shelves this weekend were an absolute must …. and the shawl storage being overly full …. and the week’s salary price tags on the shawls, neither of them came home with me. I did get shelves though. They are fabulous for storage.